Month three Tigress’s can jam canning challenge and the chosen ingredient covers a multitude of choices, as anything classed as an allium fits the bill. I intended to post about pickled wild garlic but with the deadline looming and this post ready to roll, I’m running with pickled onions instead. The wild garlic, almost completed, will follow after. I’m really more of a jam and chutney person but the Tigresscanjam challenge is giving me reasons to explore things I want to know more about. Pickles aren’t something I’ve developed much of a taste for and I hadn’t thought that they figured much in my upbringing. Then I remembered an onion and vinegar condiment, served at my grandparents house when I was little, as an accompaniment to Lancashire hotpot. 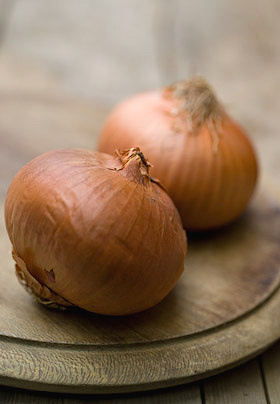 It was made very simply of chopped raw onions marinated in malt vinegar, simple as. Never a great meat eater, I recall especially looking forward to this onion relish, eaten with the delicious sliced potatoes that were part of the hotpot. My cousin Jackie, an ex-Blackpool landlady who can rustle up a mean Lancashire hotpot, told me that this onion relish is the traditional companion to this regional speciality along with pickled red cabbage. Though I have no recollection of ever being served pickled cabbage as a kid, knowing this makes me pleased that pickling is part of my own heritage too, something I’d managed to forget about until the canjam challenge got me thinking. 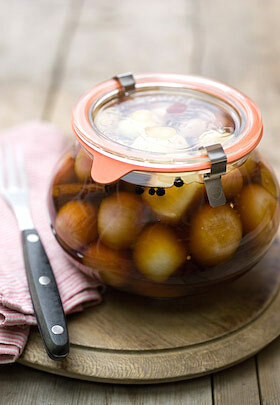 Then last week I found this onion-shaped Weck preserving jar in a charity shop, so filling it with pickled onions seemed perfectly appropriate. Pickling has to be one of the easiest things ever. I’ve chosen to make a sweet pickling vinegar using traditional malt vinegar with added brown sugar, honey plus a few spices. Pickling vinegars are really delicious and give plenty of scope for experimentation. Any leftover vinegar can be turned into salad dressings or be drizzled on your chips. 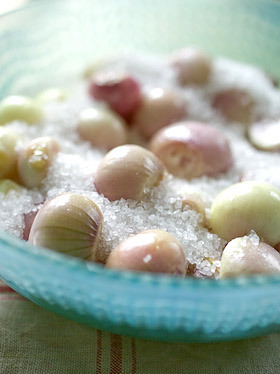 The shallots need to be salted at the beginning to draw out excess liquid, which will help the onions to retain their crunch. I have hot water processed my jar of pickles to meet the criteria of the challenge, give myself more practice at canning and to use the jar in the way it was intended, but pickled onions are a pretty safe bet without that palaver. The processing makes them extra safe. Pour boiling water over the shallots, leave them for a few minutes, then drain and rinse with cold water. Remove the skins and place in a glass bowl, sprinkling the salt in layers over them. Leave overnight, then rinse and drain them before packing into the hot sterilised jar. Place the vinegar and the remaining ingredients in a pan, stir over a medium heat to dissolve the sugar and honey, then bring to the boil. 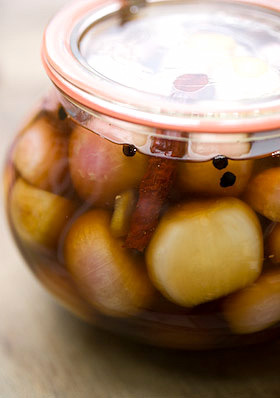 Pour over the onions to cover, pushing the chilli and cinnamon stick between the shallots on the outside of the jar, leaving 1 – 2cm (1/2 – 3/4in) headspace. Seal with the lid and process for 15 minutes in a hot water bath. For more info about how to hot water process, refer to the guide here. You could use 2 500ml (1 pint) sized jars instead, in which case you only need to process them for 10 minutes. Once cooled store the pickled onions for 4-8 weeks before eating. Lovely! I’m not generally partial to a sweeter pickle, but am tempted with these onions. I usually do a few jars of pickled green cherry tomatoes (for nibbling and cocktails alike) – a few onions in the mix I think would be very excellent. Thanks for the inspiration! I wish I could try your shallots and see how the different spices and especially the honey, make them different from my lot. I especially wish I could try them alongside a Lancashire hotpot and pickled cabbage! Loving that jar! And the picture of your salted shallots is just gorgeous. Funny how I’ve seen the salting step in a lot of the pickled onion recipes, but it wasn’t in my recipe for shallots. I haven’t yet tried them yet, but I wonder now if they will be a little limp. Now you have the perfect excuse to make Lancashire hotpot! Gorgeous! That jar was a score. Wecks just make everything pretty. And I love shallots! How do you pre-sterilize a weck jar (for recipes where you must start with sterilized, not just clean jars)? I just don’t know how to deal with the metal ring–I know you can take it off but dealing with all that hot…yikes! And then water bath prcoessing later–how does that all work? Miss Laundress 😉 I see I am not the only one with an onion habit. Beautiful pickles in a beautiful jar – and yes, this canning stuff is addictive, isn’t it? As canning or bottling isn’t as popular in the UK as in the US, our jars (Kilner) are 2 to 3 times more expensive than your Ball jars in the US. Weck jars aren’t too easy to find either, but some styles are available from Manufactum (a German mail order company operating in the UK) by or they can be bought online direct from Weck in Germany. It is also possible to buy Italian (Bormioli – Quattro Stagioni jars) and French (Le Parfait) canning jars, but again they are quite costly, so are a big investment for anyone starting out on their canning journey.